← How Excel formula can save your time? 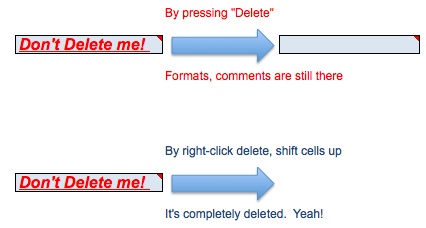 Do you have a habit of right-click a cell and Delete it rather than pressing the “Delete” button on keyboard? 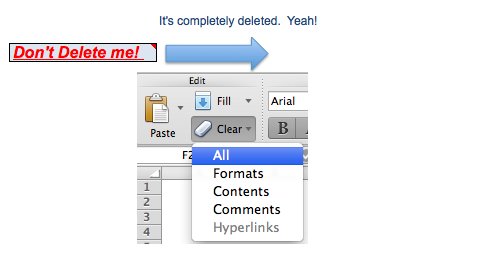 Basically, pressing “Delete” key simply means “Clear Contents”. 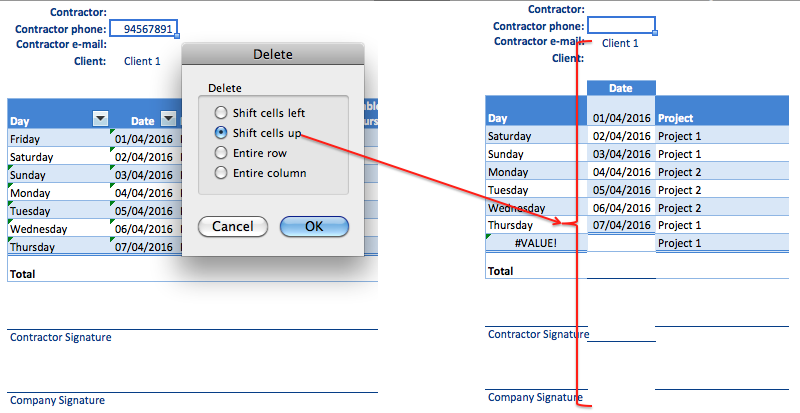 Comments, Data Validation rule, Formats remain in the cell. This may be undesirable. You are actually “Deleting” the cell from the spreadsheet. That’s why you could remove everything instantly by this action. ooops… per your request, all cells underneath go up. So ugly now. 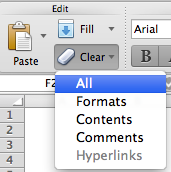 Remind you that sometime you do not notice the impact right away if you are working on a large spreadsheet. The table may be sitting well below that is out of the screen. It will be too late when you realize the “destruction” made by yourself. Oh! That’s right. I learn from mistake. So now when I delete a cell, I select “Shift cells left” as I have already checked that there is nothing on the right: Shifting cells to left should impose NO impact on the tables. Yes! You are correct partially. Although there is no impact on the structure of the table, some figures turn to #REF. Why? Because those cells contain formula with cell reference to “Hourly Rate” that you had just deleted. OMG. How come this is so troublesome to delete a cell? My answer is YES if you insist on “Deleting” a cell. But why you need to “Delete” a cell when you have a better alternative? Is this way much more direct and efficient? Please leave your comment. This entry was posted in Excel Basic, Excel Tips and tagged Clear. Bookmark the permalink.